He had a brilliant mind, but this favorite student of mine struggled with one main issue in fourth grade: handwriting. It was hardly legible and even other students commented while working on group projects how difficult it was to decipher. It affected how he viewed himself and his abilities. He’s now in middle school, but he still wants to improve and because he was so far behind, there is still much to work on. So he has asked me to tutor him. The problem began in kindergarten because he never learned to hold his pencil correctly. Kudos to you valiant kindergarten teachers that spend quality time on this issue. If you only knew how much you impress the rest of us when you help a little five year old conquer this fundamental area! I wish I had an Interactive Whiteboard back then. This would have saved me making hundreds of worksheets for school and extra practice at home. 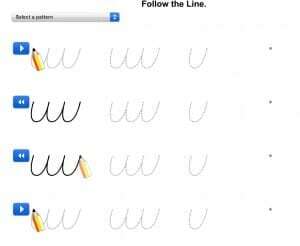 This tool animates the common strokes of handwriting of all the letters of the Alphabet (open/closed garland, arcade, etc.) Then, after students see how to do it from beginning to end, they can practice. We know that students that struggle with handwriting often find small motor skills difficult. That’s why working on the Interactive Whiteboard can really help. 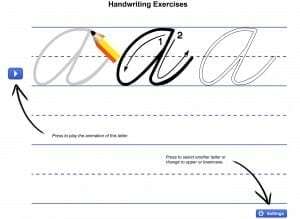 After you have practiced the letters of the Alphabet, try the patterns tool and numbers tool with big motor motion and then work down to the correct size on paper when the strokes have been achieved. You will love the tool for making letters, numbers and patterns which can be adapted for whatever kind of penmanship you are working on…print, or handwriting, D’Nealian or Zaner Bloser, capital letters or lower case. It just takes a couple of clicks and you’ve got exactly what you want. No fuss! No muss! Another area to touch on with students is the importance of writing neatly, but it doesn’t always help to tell them why you think that it’s important, so I wrote this lesson on creating persuasive paragraphs with the topic: Why Handwriting Is or Isn’t Important. Let your students brainstorm deep reasoning on the subject and teach them the form of a persuasive paragraph at the same time. We can improve handwriting by improving their “want to,” so motivation is another key to success. We look at the signatures on the Constitution and examine John Hancock’s signature closely. Remember, he wanted to make sure the king could read his name so he wrote with large letters. I have them look over all the signatures and then think about what kind of impression their signature will make in another couple of centuries when people view it. It’s easy to see that all the signers showed great effort in signing their names very neatly. They took time to do their best on this important document. It was a matter of great importance to these busy men. This particular student is a great “writer”, so we close our tutoring session with having him sign his autograph for me. I tell him that someday he may write a great book and I’ll be the first in line to buy a copy. The book will cost me a lot of money and so he must make the autograph worth the twenty or more dollars I will spend. We are making progress.